This is an excellent dish Harini. Love how inviting your bowl looks. IP has become such an integral part of your cooking and its amazing how many dishes you dishing out of it..very nice! This is an excellent and well balanced kichdi recipe.Wish to have the bowl of kichidi..
After IP, I have hardly used my pressure cooker. This is exactly how I like my kichadi, a little bit on the runny side. I love switching rice with millets. 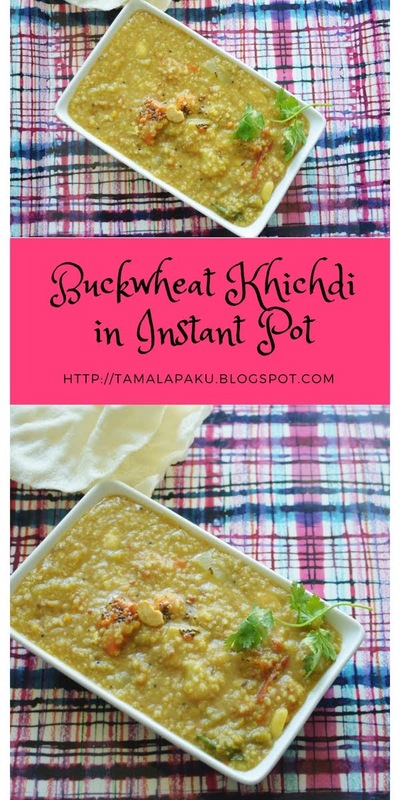 This kichdi looks absolutely yum and making it in instant pot saves so much of time and effort..
Real good option , I love the way you come up with these interesting options . The Khichadi looks excellent . Even I am amazed at how frequently you use the instant pot just like we use the pressure cooker. Such a healthy and tasty. Last year when I was in India, my daughter had some buckwheat groat in her pantry and I made some khichdi with it. Turned out so delicious. Adding peanuts to it makes it more interesting. Lovely recipe. Wow..buckwheat khichdi.. is full on protein packed dish and very comforting food for everyday meal. That is a lovely twist to the traditional khichadi.....looks so inviting!